In 1908, in Paris, a gentleman named Albert Dupuy premiered the world’s first ever convection oven after pondering the question “What does it really mean to cook?” Since 1908 La Cornue’s desire for excellence leads them every day to handcraft exceptional and personalised products that will bring culinary dreams to life and maintain the flame of French Art de Vivre. Today, La Cornue has continued to build upon Albert’s initial convection innovation. 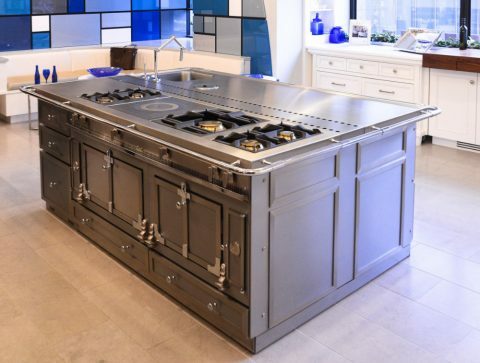 They’ve expanded the design, introduced new styles, and continually sought a degree of excellence that’s unmatched in cooking engineering. For gourmets and gastronomes, La Cornue is simply a masterpiece. 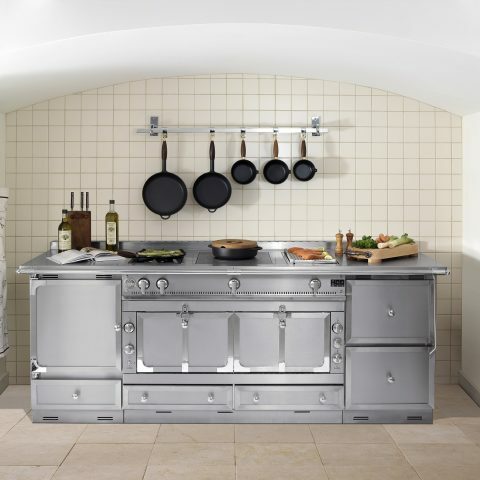 Range Cooker or Work of Art? A La Cornue is both! Each La Cornue Château is manufactured exclusively to order, individually assembled by a single La Cornue artisan, or compagnon, who will take all the care necessary to make it a unique piece. It is then numbered by the compagnon, as a limited edition work of art would be. The artisanal nature of La Cornue and their unique savoir-faire enable them to meet any development challenge, whether to respect the constraints of a historic home or to innovate within a futuristic design. Which features will suit me Best? La Cornue cookers are handsome, stand out pieces of equipment. The Grand Palais 180, part of the Château range, is the jewel in the crown. Available in both gas and electric options, it boasts the vaulted ceiling to the professional-capacity oven, and the gas version now comes with an innovation which La Cornue calls the RCC disk. This disk type structure to the oven floor allows heating in a three-fold fashion: radiation, like a grill; convection, as traditional oven cooking; and conduction, as the heat rises from the disk. Available in 26 colours, including ‘greige’, described as the ‘colour of raw silk’ means that choosing the colour of your Le Château is just part of the bespoke commission. 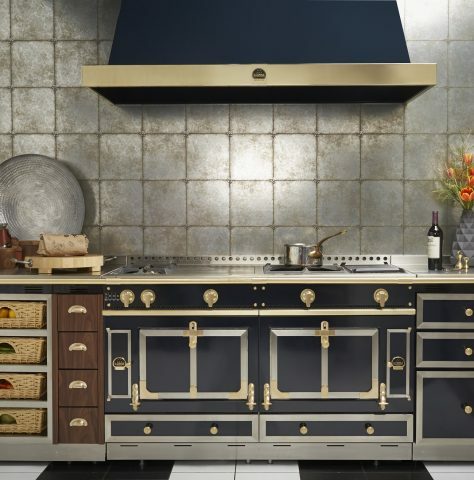 Alongside the range cookers, La Cornue product extends to exquisitely designed kitchen cabinetry, including their superb Island Units, designed around the Château of your choice, whilst the Flamberge Rôtisserie turns and roasts food to perfection. Where can I view and buy a La Cornue? La Cornue ovens, ranges and rotisseries are not mainstream purchases. They are rare finds in any kitchen and aimed at those looking for the very best in culinary appliances. As such, there are very few stockists of La Cornue in the UK. Indeed the only place to view and buy a La Cornue range cooker west of London is through Hearth and Cook. At our showroom in Exeter we offer a complete range of appliances from La Cornue: from the premium Le Château range with prices starting at £29,520.00, through to the mid-range CornuFé 110 at £6,030.00. Talk to our knowledgeable staff about your bespoke requirements and we will talk you through exactly which features will suit you best. View, experience and buy the ultimate in cooking equipment derived from the nation who invented haute cuisine, from Hearth & Cook. For those who aspire to a whole new level of culinary excellence, visit our showroom to see just why La Cornue, established over 100 years ago, still reigns supreme in the kitchen.